This exceptionally beautiful book was first published in 1867 under the title "Examples of Chinese Ornament". 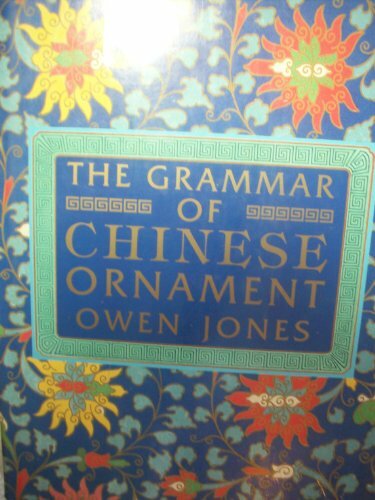 It was compiled and written by Owen Jones, the high priest of Victorian decorative arts whose great "The Grammar of Ornament" was originally published in 1856. THE GRAMMAR OF CHINESE ORNAMENT was first published in a limited edition of 300 copies which are now among the volumes most sought after by antiquarian book sellers throughout the world. THE GRAMMAR OF CHINESE ORNAMENT book contains 100 color plates sowing decorations from painted vases, bowls, and other Chinese ornaments which were imported to the West in increasing numbers in the middle of the 19th century following the Ti-Ping Rebellion. The principles of Chinese ornament derive from the Moorish designs in which the surface of an object is divided into triangles of proportionate area by spots of color which are then united by a continuous line. Into the spaces created by this basic pattern are introduced smaller decorative patterns until the whole surface presents an even design. It is a peculiarity of much Chinese ornament that the principle flowers, the objects very often used as the focal point of the design, are unusually large with the secondary masses also balanced triangularly, but in a less rigid manner than the larger flowers. In all Chinese ornamentation, triangulation is the main feature with the geometrical arrangement absolute and undisguised. The various styles of design used almost universally throughout Chinese ornamentation can be traced to laws of design found in nature. THE GRAMMAR OF CHINESE ORNAMENT is a significant source book for all designers and artists. The careful and meticulous reproduction of the original colors will make this volume a delight to the eye as well as a welcome addition to the library of everyone interested in the fine arts.